The CVC370-2 Charles is the vacuum cleaner of choice for those who want a machine built without compromise. Charles is a wet or dry vacuum cleaner. Most of the time it will be providing the same great performance in dry tasks as we've come to expect from his brother Henry, but then a quick switch and Charles will be there unblocking a sink or drying a wet floor. Charles is normally supplied with Numatic "Accessory Kit A21A". The A21A kit metal components are made of aluminium - chosen to ensure no rusting due to wet work. When buying your Charles you want to make sure you find a good supplier. Online it can be difficult to know which suppliers you can trust but I have found, to my surprise, that Amazon sell other things beside as books. What's more they have some of the best vacuum cleaner prices and provide the security of buying from a well known and trusted company. So I have included a Charles product link to Amazon on this site which displays their current price. And remember, with Amazon delivery is included in the price shown. 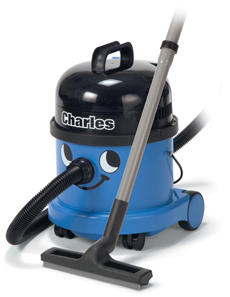 Simply click on the link to purchase your very own Charles wet and dry Vacuum Cleaner.